Having a lawn mower can help you maintain your garden perfectly. Still, if you want to be safe while using it, you should follow the tips in this post by Marland Enterprises in Cazenovia. Call Marland Enterprises at (315) 727-4645 to purchase high quality products for your lawn mower's maintenance, such as the best synthetic oil in Cazenovia. Even though your riding lawn mower has a small engine, this doesn't mean that it's not a complex machine that could be dangerous if not handled properly. For that reason, you should learn what you can about it, so you have a better idea of how to operate it, how it works, and more. A great way to get more information about it, is to simply read your owner's manual from beginning to end. In it, you'll find specific tips on how to ensure you're using your lawn mower in a safe and effective manner. Not to mention, you'll find tips on how to maintain it perfectly. Riding your lawn mower, taking it for a spin, and more, may seem like fun. However, you need to treat it like any other vehicle, as being reckless while you're using it can put your and other people's well-being in peril. That's why, you should never use the lawn mower if you're drunk or high, as you may lose control of it. Also, you need to be on high alert while using it, so you can notice anything weird on your path. It's also recommended that you never leave it on and unattended. Finally, be sure to always follow the instructions mentioned in the owner's manual, to ensure you're using it the right way. As mentioned a few times over already, you should treat your lawn mower like any other vehicle. This means that you absolutely must maintain it properly to avoid technical malfunctions that could render it useless or that could put you in danger. For that reason, you should have a professional mechanic look at it every so often. Also, remember to pay attention to it when you use it, so that you can notice if something isn't working as it should. If you do find an issue, be sure to address it as soon as possible, to keep it from becoming an even bigger problem. Buy AMSOIL 10W-40 Synthetic Small Engine Oil, the most effective synthetic oil in Cazenovia for your small engine's maintenance. Something you need to be careful of when you'll be mowing the lawn, is the attire you don. This is because, wearing the wrong thing may put you in a risky situation. To prevent a disaster, you should wear sturdy, closed-toe shoes, and fitted clothing (something too long or loose can get caught in the mechanism). Finally, don't forget to wear sunscreen, sunglasses, and a hat if you'll be working on a sunny day to protect your skin. It's no secret that children love playing in the garden. Not only that, but they're very curious, which may make the riding lawn mower very interesting to them (some may even try to use it). That's why, you should take some extra measures to keep children safe: keep them away from the riding lawn mower (especially when you're using it), and don't let their hands reach the blades, as this could have seriously horrific outcomes. Before you begin working on your lawn, you need to inspect the place you'll be going over thoroughly, so you can be made aware if that are any objects you should remove before you start. Branches, rocks, toys, and other things can get caught in the mower's system, or be thrown aggressively by it. 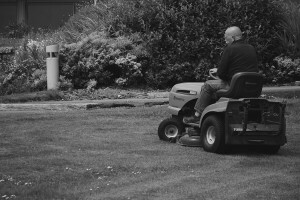 Do a little bit of a recon job prior to the mowing of the lawn so you can avoid an accident. As a last tip, you need to be extremely careful if something gets caught in the mower's mechanism. If that's the case, you should turn the mower off before reaching for it. Once the lawn mower off, remove the stuck item with extreme care. Avoid touching the sharp blades and make use of tools, if possible, to get the thing out. Call Marland Enterprises at (315) 727-4645 or go hrough AMSOIL's online shop to get your hands on the best products for the maintenance of any of your vehicles, including those with small engines.